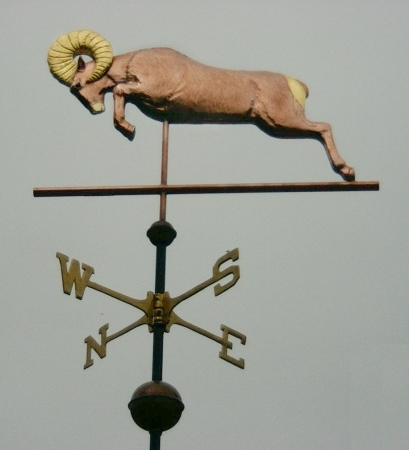 The Charging Bighorn Sheep Weather Vane, Ovis canadensis, is especially spectacular when seen silhouetted against the skyline. With its powerful body, unique curved horns and dramatic pose, we have attempted to capture the beauty of this iconic symbol of the mountain west. As shown here, we added optional gold leaf to the ram’s horns, rump markings and muzzle. We even ordered custom glass eyes to give the Bighorn a lifelike appearance. Because every weathervane is made to order, we can vary the metal combination we use to construct it. Some customers prefer a classic, all copper weathervane. Others like a subtle contrast in metal color and choose copper in combination with brass, however, the most popular variation is the one shown here, with the optional gold leaf horns and rump patch. Outdoors, copper will first weather a deep chocolate brown color. Brass, which is 70% copper, patinas similarly to the copper. Any added gold leaf will retain its luminous golden color for many years to come. This metal combination is particularly effective for this brown colored sheep with lighter colored markings and showy horns. In addition to offering the Charging Big Horn Sheep Weathervane, we also offer a version showing the Big Horn in the classic ‘sentinel’ pose, standing on the edge of a mountain ledge, regally surveying his kingdom. As with this ramming bighorn design, customers can select the metal combination that best suits their preferences. Bighorn Sheep are famous as mascots for many sports teams. They also serve as the logo for a number of companies based on its powerful and wild nature. The Apsaalooka (Crow) people and the Shoshone people also honored this animal in their mythology and for the food it provided. 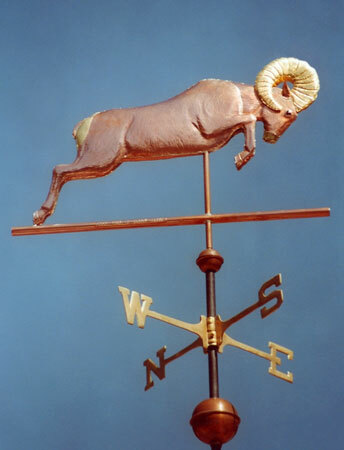 Further, the ram is the astrological symbol for Aries; Mar 21-Apr 19 birthdays; the first symbol in the Zodiac. The name Aries is Latin for ram. As a constellation in the night sky, you will find it listed also in our Mythological Category.